This was a movie that had been playing since 28 March in Indonesia. However, as I went for long holiday starting from that day, I did not get the chance to see it since it premiered. I did however manage to see this yesterday with my wife. We were a bit undecided at first where to watch it, since it did not play in my favorite theater with Dolby Atmos system, but then I remembered it was a Sunday and I had a bank card that give me promotion every Sunday. So off we went to Plaza Indonesia and saw this one at the studio with exactly the sound system I wanted. OK, enough of those now and let us get started with the movie. Story was set in the year 2045, where the condition of the cities were very densely populated and people felt that the virtual reality world (referred to as OASIS) was more enjoyable than the real world. Wade Watts (Tye Sheridan - X-Men: Apocalypse, The Stanford Prison Experiment etc) was a teenager who just like any other people, also went to OASIS most of the time. He used the avatar name of Parzival and considered himself as a Gunter (Egg Hunter due to his mission to find Easter Egg in the game). In OASIS, Parzival was best friend with Aech (Lena Waithe - Master of None TV series etc). During one of the race, Parzival met with another famous mysterious Gunter named Art3mis (Olivia Cooke - Ouija, Bates Motel TV series etc) who later on would be like his partner in acquiring the Easter Eggs. The reason why Easter Eggs were sought for were due to OASIS' inventor, the late James Halliday (Mark Rylance - Dunkirk, Anonymous etc) informed that he would provide the stocks of OASIS that would be worth a fortune and also full access to OASIS for those who could find the Easter Eggs. Due to OASIS high value, another big corporate in the virtual reality business called IOI also took a big interest in making sure they got those Easter Eggs. Their CEO, Nolan Sorrento (Ben Mendelsohn - Rogue One: A Star Wars Story, Darkest Hours etc) would do anything to win by enlisting the help from a shady character called i-R0k (T.J. Miller - Deadpool, Office Christmas Party etc), plus a team of many experts in pop cultures. Using his vast knowledge of Halliday's personal lives including his relationship with his partner Ogdon Morrow (Simon Pegg - Star Trek Beyond and its prequels, Hot Fuzz etc), Parzival would slowly start to find out the clues in order to search for the Easter Eggs. Together with 2 other brilliant Gunters Sho and Daito, they would have to race against time with the IOI team who had its own agenda on OASIS. So could Parzival and friends save the OASIS? Find them all in this exciting science fiction adventure movie. Wow this movie was truly amazing for me personally. It had so many elements that made me very excited and happy like a young kid. 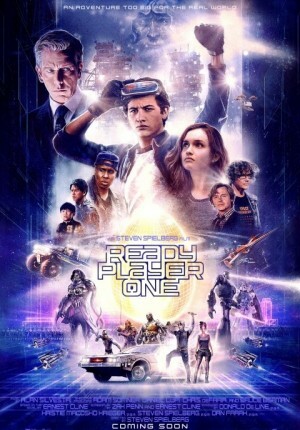 The movie was full of things that I truly love, like video games (and their characters), famous movie & TV references, even 80s songs. It was a fantastic feeling to watch this film from start to finish. Even my wife kept on jokingly tease me for getting so excited. Aside from those many pop culture references, as a science fiction adventure movie, this one was really great. The story was very thorough and complete, from the explanation of OASIS and its creators, the interesting adventure to find those Easter Eggs, the friendship & love story, a bit of mystery and twist, some humor here and there, plus a fun to see main villain & his supports (Btw, i-R0k's character was very fun). The visual effects of this film were truly amazing especially with the support from the famous Industrial Light Magic (no doubt most of the movie's budget went to this area as the movie cost a hefty USD 175 million). The sound effects of Dolby Atmos was perfect and I was really amazed. The musical score was also great especially with various nice songs appearing at just the right moment, like the songs Faith by George Michael, Stayin' Alive by Bee Gees or the last song by Twisted Sister We're Not Gonna Make It. Movie's duration of 140 minutes including end credit (which did not have any post end credit scenes) seemed suitable for such a complete story. The film also felt balanced in term of screen time in the real world and in OASIS (not a complete computer animated movie that general audience might not like). In term of its story itself, it should be seen as an adventure movie in the virtual reality world. But what was very wonderful about the film, was the fact that it had a very big moral message about the best of living in the real world instead of the virtual world. Oh the final battle in OASIS was also very awesome and cool, plus the finale was fantastic as well with 1 or 2 nice surprises. The only thing that I found a little bit disturbing was the emotional moment involving Wade and his aunt Alice (Susan Lynch) was too brief and did not seem realistic to me for a passionate person like Wade. But other than this small thing, I think the movie was perfect (at least for me). My wife was surprisingly entertained by the movie as well, as she thought she would not really like it and not really interested at first. Overall, the movie could not have been this wonderful had it not been directed by Stephen Spielberg, who I understand from the various information I read, went all the way to gather the copyrights for the characters and references to be used in the film. Btw, this was a movie adapted from the novel with same title, written by Ernest Cline. So if you are fan of those amazing cool things I mentioned above, you would surely be in love with this movie and be entertained by it. But if you are not a fan, then the movie might feel too weird, too childish, too much vintage things and so on. Regardless though, I would recommend this movie to be seen and enjoyed as an adventure movie.